We just finished a five week cross country trip from FL to CA and back in May. We stayed at 9 military RV parks. All are very different. This was by far my favorite military RV park. It was nice and quiet. The folks there are extremely helpful and nice. We stayed in the clubhouse watching TV and using the Internet while we did our laundry. 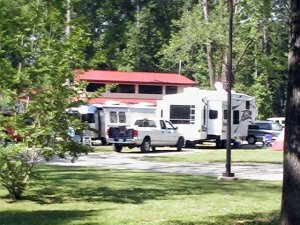 The commissary and Exchange is a few miles away from the RV park. Just a lovely, comfortable place to stay. I highly recommend.